Tesla said it will be profitable in the second half of 2018 - but only if it can make 5,000 Model 3 cars every week. Reaching that goal is in doubt given the electric car maker produced just 2,270 in the last week of April. Tesla is striving to produce more cars as questions mount about its financial situation. The company posted a record quarterly loss of almost $710m (£523m) for the three months to March - more than double the same period last year. Revenues jumped 26% to $3.4bn, but it continued to burn through cash. Tesla said it would cut capital spending this year to less than $3bn as it focuses on "near-term needs". Elon Musk's firm also told investors that it will deliver more of its expensive luxury models in the second half of the year. Tesla's manufacturing challenges persist, however. It suspended Model 3 production in mid-April in a planned shutdown and expects a total of 10 days of downtime this quarter. The company is trying to improve its manufacturing process of the Model 3, its newest car aimed at the mass market. "We made a mistake by adding too much automation too quickly," Tesla told investors on Wednesday. Efraim Levy, an analyst at CFRA, said the results were "mixed", noting the decline in the firm's available cash. On a call with financial analysts, the strain over the firm's finances was apparent. Mr Musk refused to answer a question about the number of Model 3 reservations, and cut short an exchange about Tesla's spending plans. "These questions are so dry. They're killing me," he said, moving to take questions from a private shareholder and owner of a finance-focused YouTube channel rather than an institutional analyst. 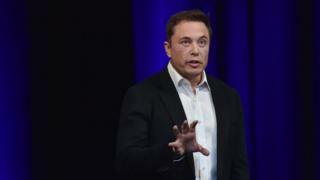 Mr Musk also criticised media coverage of accidents involving driverless cars, saying reports gave a misleading impression about the safety of such vehicles. Tesla shares, which had declined slightly at the start of the call, fell about 5% in after-hours trading in New York. Mr Musk said investors should be focused on the long-term and dismissed concerns about rapid stock movements. "If people are concerned about volatility, they should definitely not buy our stock," he said. Despite its heavy losses the company is worth about $51bn - roughly as much as General Motors, America's biggest car maker. Jamie Albertine, an analyst at Consumer Edge, said in a note: "Steady, a word not often used in describing Tesla, is becoming more of a reality as management continues to chip away at its 5,000 units per week Model 3 production goal." He estimated the company would hit that target in the second half of 2018. Is Tesla heading for trouble?